43 “You have heard that it was said, You must love your neighbor and hate your enemy. 44 But I say to you, love your enemies and pray for those who harass you 45 so that you will be acting as children of your Father who is in heaven. He makes the sun rise on both the evil and the good and sends rain on both the righteous and the unrighteous. 46 If you love only those who love you, what reward do you have? Don’t even the tax collectors do the same? 47 And if you greet only your brothers and sisters, what more are you doing? Don’t even the Gentiles do the same? 48 Therefore, just as your heavenly Father is complete in showing love to everyone, so also you must be complete. What is perfection? If “to err is human,” and perfection is something only the divine can attain, then at the very least perfection is an unattainable goal that should be abandoned before people get hurt pursuing it. The problem is, for Christians at least, Jesus suggests that we should be perfect, even as the heavenly father is perfect (Matthew 5:48). Perhaps we can do what so many before us have done and put the Sermon on the Mount off to the side as a counsel of perfection that describes the next life, not this life. It is a description of the Kingdom of Heaven, and we’ve not reached that state, and won’t reach that state, so just let it go! And, yet, there is that nagging feeling that Jesus did mean for us to pay attention to this word. This lengthy Epiphany season has given us the opportunity to move step by step through the fifth chapter of Matthew. Having called us to be Salt and Light, Jesus proceeds to offer six antitheses. A week prior we covered four of them – bans on murder, adultery, divorce, and taking oaths. As if these were difficult enough, Jesus offers to more antitheses, each of which includes a statement such as this: “You’ve heard it said . . . but I say to you ....” These are difficult words that push us beyond the letter to the spirit of the Law. The final two antitheses focus on retaliation and love of one’s enemies. It is this final antithesis, the one having to do with loving our enemy, which might be most difficult and yet is the most important of them all. Even as the 10th commandment, dealing with coveting, is the key to the Ten Commandments, in many ways this word is the key to understanding the nature of Jesus’ vision of the Realm of God. In loving not just our neighbors, but our enemies, we begin to move more fully into that Realm. The call to be perfect, which ends this passage, is, as Stephen G. Ray, Jr. suggests, a “disposition of life that reflects God’s disposition toward creation.” By taking up this call to perfection we begin to take up God’s concern for “the well-being and flourishing of those normally cast outside of one’s circle of care” [Preaching God's Transforming Justice: A Lectionary Commentary, Year A, p. 102]. Whether we like to admit it or not, we are all tribalistic. There is an in-group and an out-group. We gather together in protective cocoons, trying to keep the threats posed by outsiders at bay. Of course, when attacked, whether physically or verbally, we must respond in kind. This leads inevitably to an escalation that often ends in violence. That’s why Jesus told his audience to take care of their anger issues before it led to murder. The recent news about Michael Dunn, the man who shot at a group of African American teens, killing one, is instructive. The incident began because Mr. Dunn didn’t like their music, an argument ensued, and for some reason, he got his gun and began shooting. Many of us find this scene puzzling, but it’s a common occurrence. It’s rooted in primal emotions. Just think back to the days immediately following 9-11. I remember the many calls for retaliation. We heard people in positions of influence calling for our military to nuke the Arab world. It didn’t matter who was involved or responsible. We just needed to blow off steam – and if we took out a million or two of our “enemies” then so be it. We ultimately invaded Afghanistan and Iraq with this same sense of vendetta. “Your people” hurt our people, so we’ll hurt your people. More than a decade later, we can see where this got us – long and unending conflicts that exacerbated the problem, rather than solving it. I would guess that most moderns find the idea of an eye for an eye to be repulsive, but it was intended to rein in retaliation and make sure that that the punishment fit the crime. If only we followed this advice, perhaps our criminal justice system would be less corrupt and oppressive. But such a counsel isn’t enough for Jesus. He offers us a better way. Instead of retaliating, even if in a limited fashion, he tells us to turn the other cheek. If someone demands your coat, give cloak as well. If one mile is demanded, go the extra. When provoked, don’t respond in kind. He wants to turn things upside down. He wants to urge us toward reconciliation, through de-escalation, which involves connecting with the heart. It is a tactic that Martin Luther King used with great effectiveness during the Civil Rights Movement. He forced the oppressor to face their own prejudices. 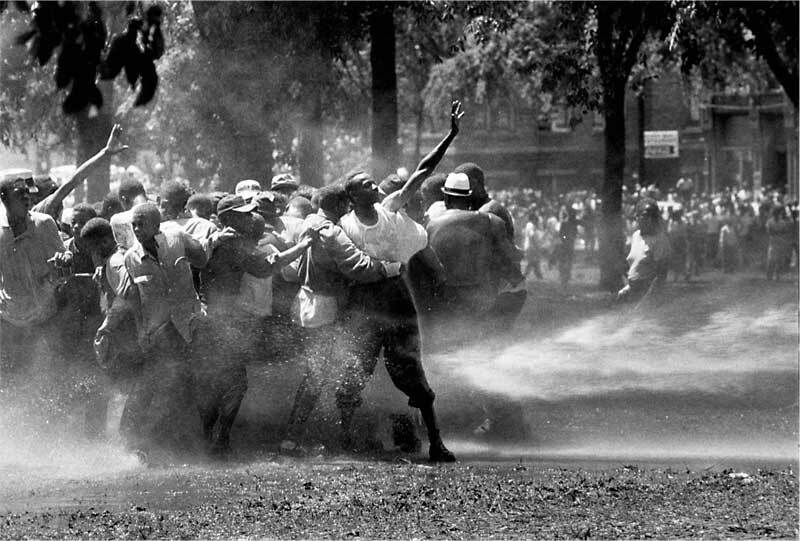 Bull Connor wanted to provoke the marchers. If he could provoke the marchers to violence he could delegitimize their calls for justice. He could turn them into “thugs.” But he failed. The marchers “turned the other cheek,” and he was exposed for what he was – a racist, bigoted man seeking to protect his turf. As this occurred, a nation that had turned a blind eye to discrimination watched in horror. Their hearts were pierced and change began to take place. Before too long an always cautious Congress was emboldened to enact far-reaching and historic Civil Rights legislation. This movement towards reconciliation culminates in Jesus’ call to love one’s enemies. Even if we have embraced the two great commandments – to love God and to love our neighbor – the identity of the neighbor can always be drawn rather narrowly. Is not the neighbor a member of the tribe? Although Matthew doesn’t record the parable of the Good Samaritan, it is an important response to that question. In this last antithesis Jesus does something similar in extending the definition of neighbor to include the enemy. Loving one’s enemy is not easy. Indeed, it is perhaps the most difficult task in life. We all have someone whom we are at enmity. Someone, somewhere, has injured us. We want revenge. We want to see them suffer – to get their due. It makes us feel good, and yet at the same time, we have this nagging suspicion that this feeling of hatred is not in line with the call to faith. In order to hate the enemy, we usually must envision them as less than human. We have to come up with names by which we can define them out of the human community. If they are nothing more than a pest – a rat or a cockroach – then it’s easier to destroy them. We see this happen during every war. But Jesus calls on us to do something different. He calls on us to recognize the full humanity of the person with whom we’re at odds. He calls on us to envision the “enemy” as being part of the family. If you love someone, you can’t hate them. As I read this final set of antitheses, I’m in the process of reading a book entitled Faith-Rooted Organizing, by Alexia Salvatierra and Peter Heltzel. Because I am actively involved in the leadership of a community organizing effort in Metro Detroit (Metro Coalition of Congregations), this call to non-violent action and love of enemies hits close to home. It is easy for us, as community activists, to see the opposition to our vision as the “enemy.” Indeed as Salvatierra and Heltzel point out, in traditional organizing, the person or group or institution that is being opposed, is seen as the “target.” In other words, they’re the enemy. For those involved in what they term “faith-rooted organizing,” this word is problematic. It even has violent implications. The authors remind us that these policy makers and corporate executives are human beings. They may be caught up in systems of power that are oppressive, but they are need of being ministered to. Salvatierra and Heltzel write: “The Holy Spirit is always at work in the soul of every human being, pushing, prodding, provoking them to do God’s will. We can be the ally of the Holy Spirit, supporting that part of a person that longs to respond” ( Faith-Rooted Organizing: Mobilizing the Church in Service to the World, p. 107). Prayer works – not in a manipulative way, but as a means to touch the hearts of people who often believe in God but haven’t discovered God’s counsel of perfection. They too have gotten up in seeing the other as the enemy.